WASHINGTON – When Raúl Grijalva showed up on Capitol Hill for his first congressional portrait more than 16 years ago, he didn’t yet own a tie. Since then, the former Arizona community organizer has gotten more familiar with the ways of Washington. Grijalva is now a powerful committee chairman in the U.S. House of Representatives, where he’s beginning his 9th term representing Tucson. 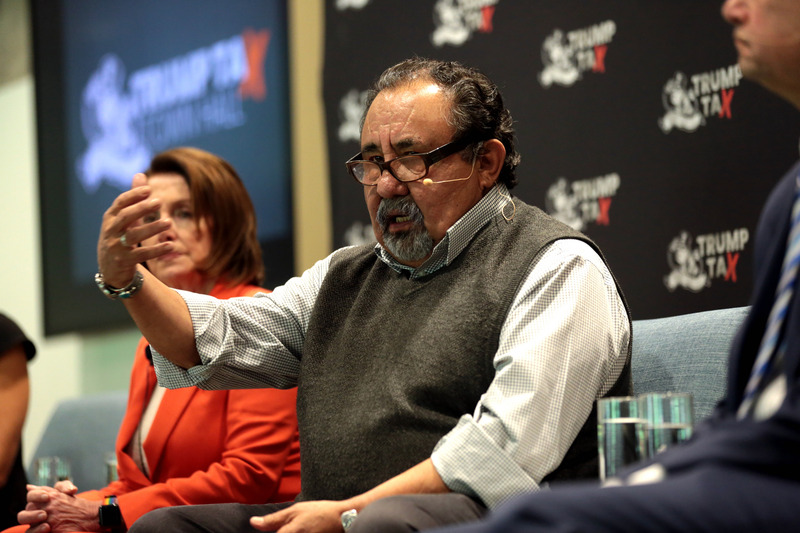 At the helm of the Natural Resources Committee, Grijalva is leading the newly empowered House Democrats as they pursue an ambitious oversight agenda targeting the Trump administration. The newly minted chairman intends to use his gavel and his subpoena power to investigate everything from industry’s influence over public lands policies to the use of science in agency decisions. “We have work ahead of us,” he told the Arizona Mirror Thursday in an interview. Grijalva, 71, has long been on the left flank of House Democrats. A 2018 survey by the nonpartisan website GovTrack.us ranked Grijalva the 3rd most liberal member lawmaker in the House, based on his legislative record. He’s not shy about assailing President Donald Trump or his top officials, either. “I made my mind up 18 months ago that this guy didn’t have the capacity and was particularly dangerous for the future of this country,” Grijalva said of the president. The Arizona Democrat’s rise to prominence this Congress is reflective of a broader shift in the caucus, said Nathan Gonzales, editor & publisher of the newsletter Inside Elections. Three months into the new Congress, Grijalva has already stepped up oversight of the Trump administration, which he says was lacking under Republican control of the House. His committee has held 14 hearings, including discussions about climate change and the Trump administration’s policies on national monuments and offshore drilling. And there’s plenty more to come, Grijalva promised. He plans to probe “conflicts of interest,” the “downgrading of science” when it comes to setting policies and the “corrupting of the agency and the culture that’s changed” at the Interior Department. Grijalva would also like to haul former Interior Secretary Ryan Zinke and David Bernhardt, Trump’s nominee to replace Zinke, before his committee. Zinke and Grijalva had a very public spat late last year, just before Zinke resigned. The then-Interior secretary accused Grijalva on Twitter of being a drunk after Grijalva called on Zinke to resign amid a flurry of ethics scandals. Grijalva has said he struggled with alcoholism in the past, but has dealt with the problem. Earlier this year, The Washington Post reported that the U.S. Department of Justice was examining whether Zinke lied to investigators in his agency’s office of inspector general. Grijalva is also eager to hear from Bernhardt, who is slated to appear before senators next week for a confirmation hearing. “There was a courtesy protocol where we didn’t call him in” ahead of his confirmation, Grijalva said. But Bernhardt can expect to soon be called to Capitol Hill. And Grijalva thinks Bernhardt – a former energy industry lobbyist and a senior Interior official during the George W. Bush administration – will be “more formidable” than Zinke was. Bernhardt “worked as a lobbyist for [and] has connections to the industry, but he also knows the agency well. I don’t underestimate him at all. I think Zinke was a little in over his head,” Grijalva said. Grijalva is also planning to press the Interior Department on its actions in Arizona, he said. He’s concerned about “mumblings coming out of Interior” that the agency may try to lift a uranium mining ban in the Grand Canyon. Grijalva last month introduced legislation to make the ban permanent. The Natural Resources Committee chairman is also concerned about Bernhardt’s previous work lobbying for Hudbay Minerals, the owner of the proposed Rosemont copper mine near Tucson, which Grijalva opposes. Top Democrats have complained that the Trump administration has so far been unwilling to cooperate with their oversight demands, and Grijalva said he’s prepared to meet resistance from the executive branch. “I anticipate the same stalling tactics,” he said. He said the use of subpoenas “has to be judicious” and he doesn’t “want to go chasing things into a rabbit hole that goes nowhere.” But, he said, he’ll use that tactic if necessary.